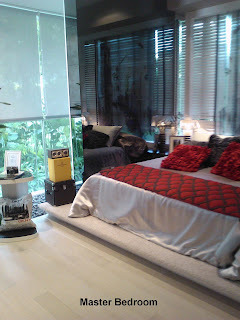 The wife and I were at the sales gallery of Skyline Residences over the weekend. 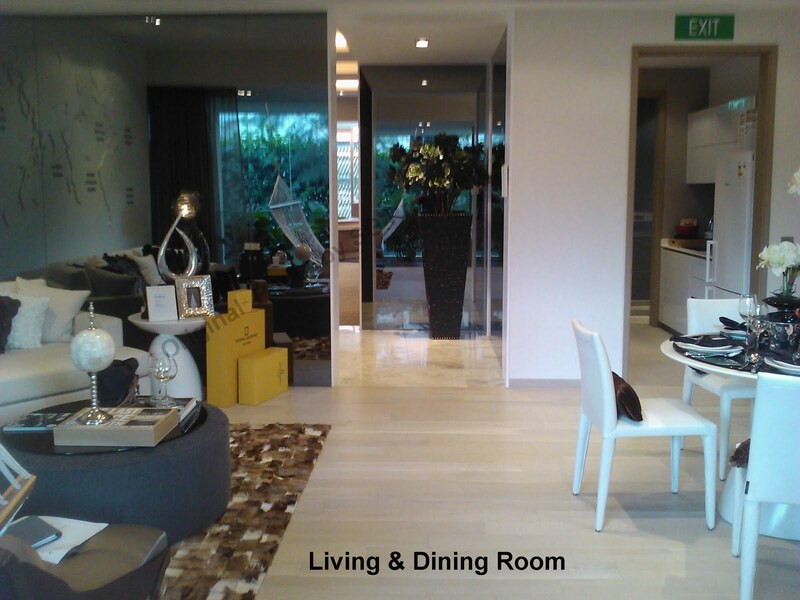 This is a freehold project by Bukit Sembawang located along Telok Blangah Road. 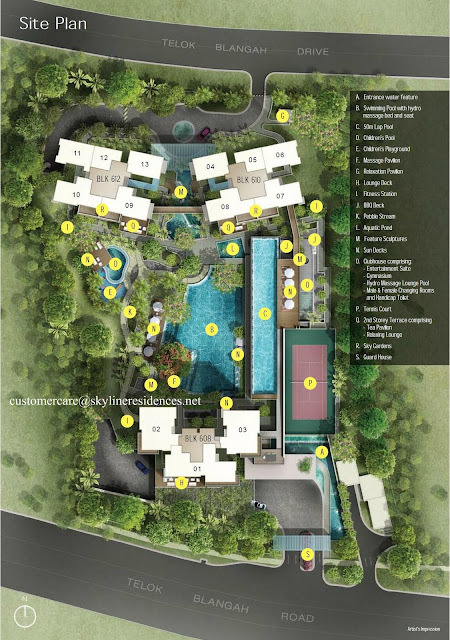 Skyline Residences sits on the plot of land that is currently occupied by Fairways. Bukit Sembawang bought the site in a collective sale back in 2007 for $244.3 million, which worked out to around $785psf ppr. It sure took them quite a while before they decided to launch the new project that is Skyline Residences. The sales gallery is located on the actual site itself. The first thing that delighted us when we stepped into the sales gallery was the scale model of the project – in addition to highlighting the condo and its facilities, the model also has mock-up of some of the landmarks that surrounds Skyline Residences. These include the cable car towers at Harbourfront/Sentosa with tiny cable cars that actually move! 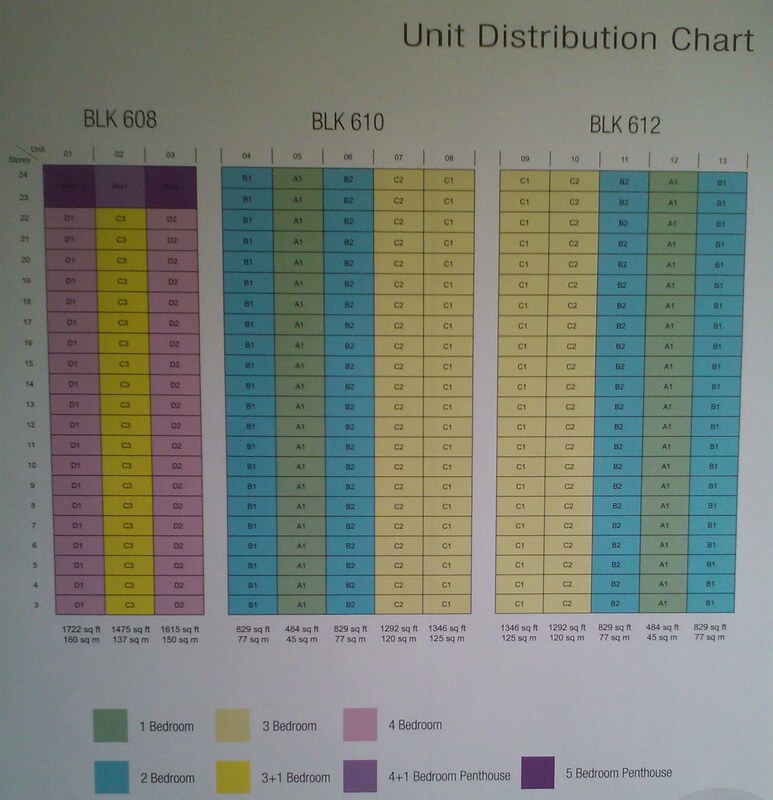 • Block 608 (which consists of only 3+Study and 4-bedders) is closest to the main road. • Blocks 610 and 612 are tucked behind Block 608 - we were told the distance between Block 610/612 and Block 608 is about 60 metres. • The condo facilities are located in between the 3 Blocks. The main entrance to Skyline Residences is along Telok Blangah Road, while a pedestrian gate located at the back of the development will provide access to Telok Blangah Drive (where the wet market and other amenities are found). Facilities wise, one is unlikely to be disappointed with the offering at Skyline Residences. It comes with all the “bells and whistles” that you come to expect in a full-facility condo these days (tennis court included). And for added convenience, an elevated walkway on the 3rd storey actually links Block 608 to the other two Blocks. For parking, there are a total of 300 lots (inclusive of 4 handicapped lots) to be shared amongst the 283 units. All the 3- and 4-bedder units as well as penthouses come with their own private lift/lift lobby. 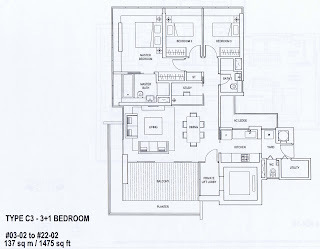 For the purpose of this review, we shall look at the 1346sqft, 3-bedder unit. As you enter the unit, you see the living/dining room. 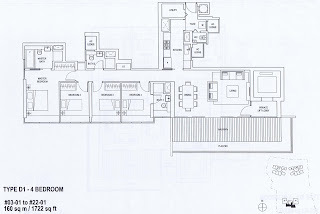 This is rectangular-shaped area and quite decent in size for a 1300+sqft unit. 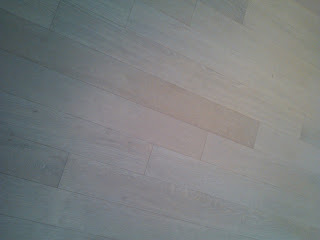 It comes with ducted air-con and for flooring, you have a choice of either 60cm x 30cm marble-slab or “engineered timber” (see photo below). The balcony/planter area extends along the whole length of the living/dining room. It probably takes up about 100sqft of space, which seems excessive given the size of the unit. 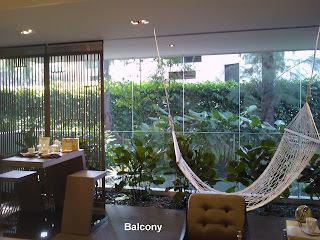 The developer has provided the option to “enclose” the balcony with aluminium sliding panels (see photo) – this will cost you another $12 – 16K depending on the size of the balcony. However, the panels are more like partitions with holes (since developer is not allowed to erect permanent enclosure in the balcony as this will flout the GFA rules), so not especially effective if your intention is to keep the rain out. 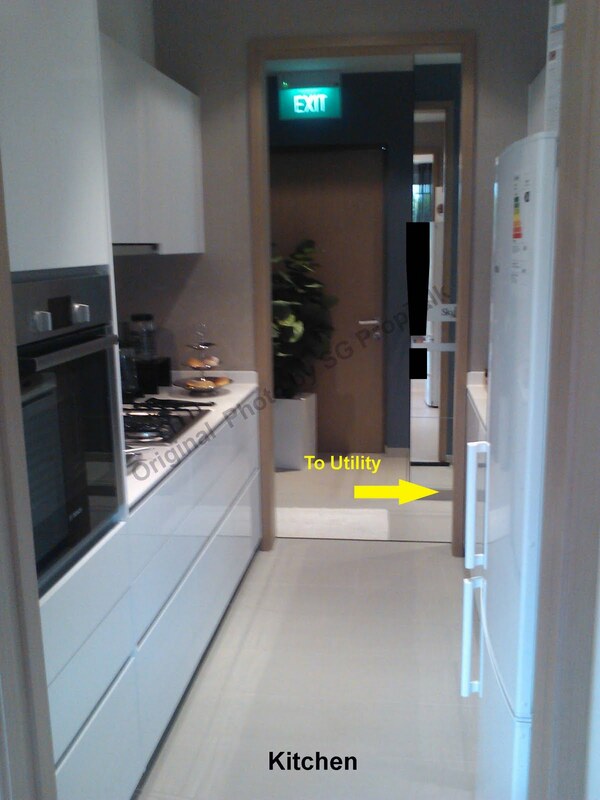 ﻿The kitchen is long but somewhat narrow, with a sliding door that separates it from the dining area. 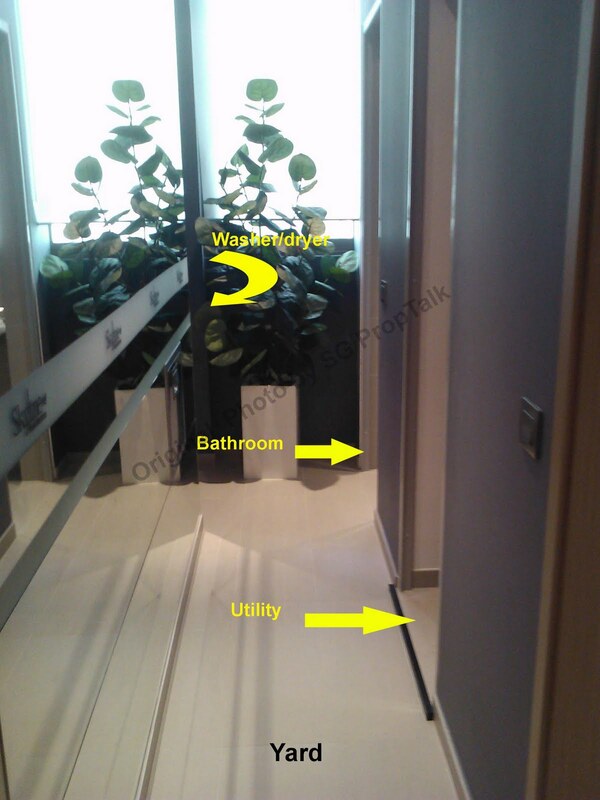 You get homogenous floor-tile, sold-surfaced worktop and kitchen cabinets that are equipped with “Blum” mechanism. The developer has also thrown in “Bosch” hood/hob/oven/fridge – the oven looked quite stylish but the hood/hob/fridge looked distinctively ordinary. The far end of the kitchen leads you to the backdoor and yard area. The yard is a long and narrow area, which is not very functional in our opinion. But you do get ample natural ventilation and lighting through a large window at the back. The utility room is tiny and probably more suited as a store rather than housing the domestic helper. 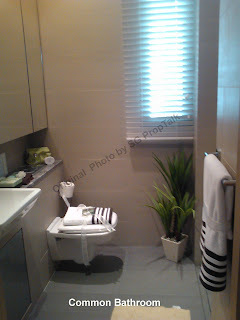 The common bathroom is decent sized and comes with homogenous-tile floors and ceramic walls. You also get “Grohe” bathroom fittings and walled-mounted “Geberit” toilet. The storage cabinet below the bathroom sink is flushed with the wall (see photo), which is quite nice. 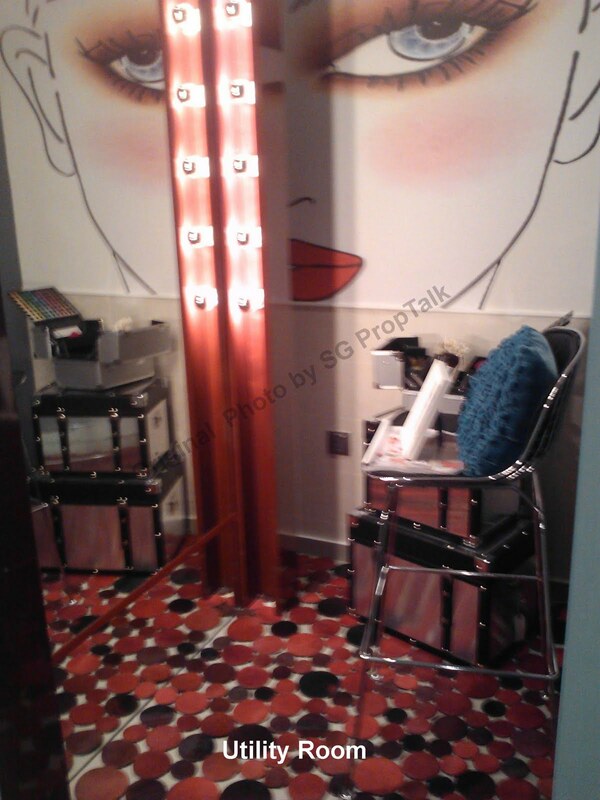 But the standard wall-mounted shower in the shower stall is not so nice. A window next to the shower stall provides natural lighting and also prevents any build-up of “strange smell” in the bathroom. 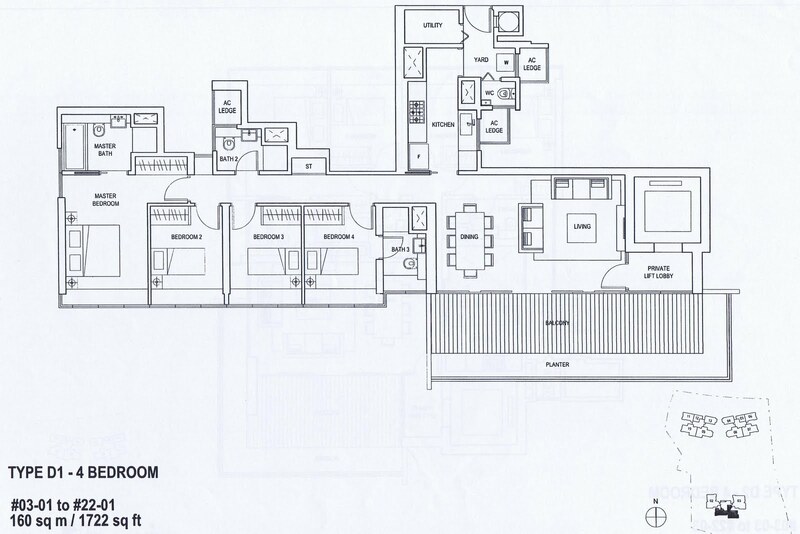 All the bedrooms are lined up against each other on one side of the apartment. The two common bedrooms are way too small. And to add salt to injury, you have bay windows to contend with. So you either have to make do with a Single bed or fit a Queen bed along the bay windows (ala Bedroom 2) – we don’t know about you but the wife and I do feel abit iffy sleeping against the bedroom window. The master bedroom is quite good-sized for a change. 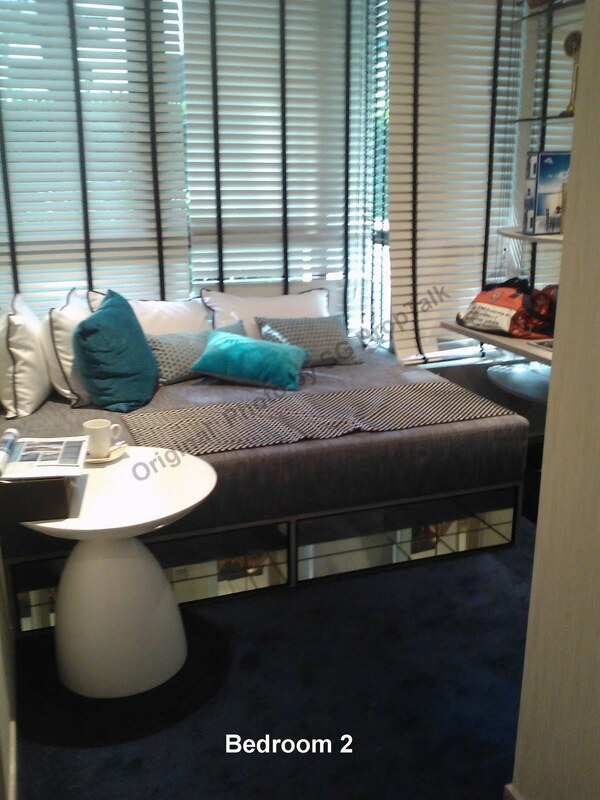 It comes with engineered timber floors, which is standard for all the bedrooms. By now you are probably wondering… what is “engineered timber”? We have done some checking and discovered that engineered timber is a structural timber product composed of several layers of dimensioned lumber glued together. It has the advantage of being free from excessive shrinking and setting and is generally stronger and longer lasting than whole timber. 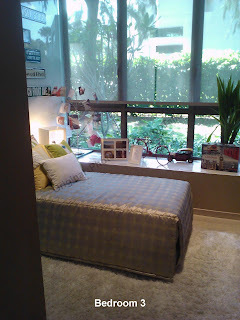 The master bedroom not only has bay windows, but also an additional planter area (accessible via a set of glass doors). The later is especially a waste of good space (do you really need a planter box in your bedroom?) that you have to pay for. 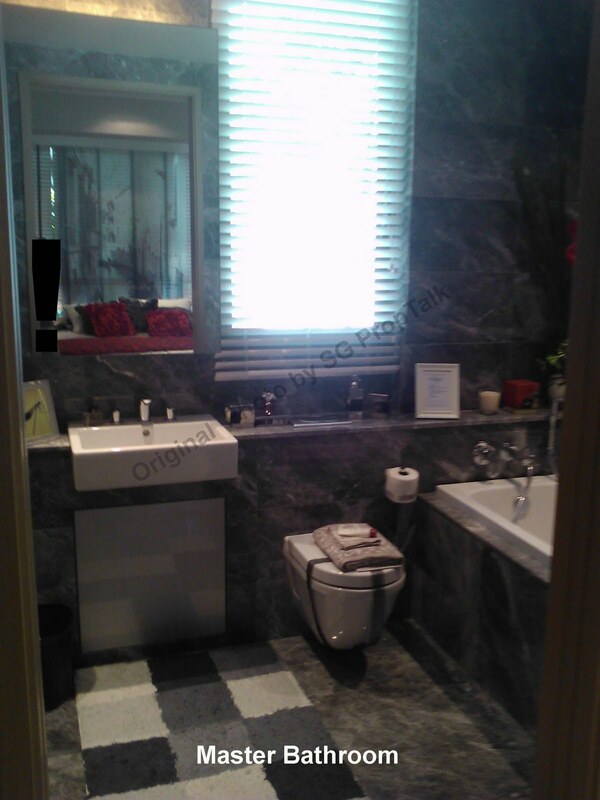 The master bathroom is quite spacious and comes with marble floors/walls. You get “Grohe/Duravit” fittings and both bath tub and standing shower (located across from each other). 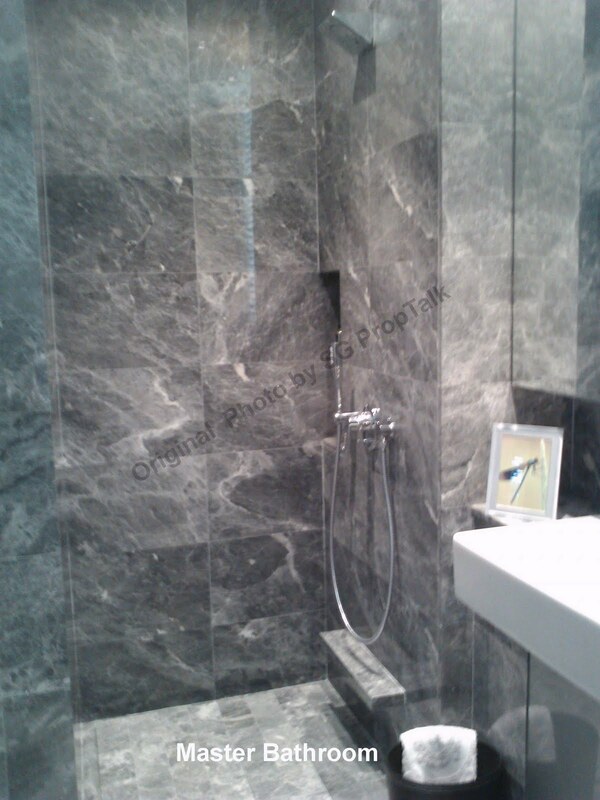 Although the shower stall is not fitted with rain-shower, we do find the “industrial-like” design quite appealing. 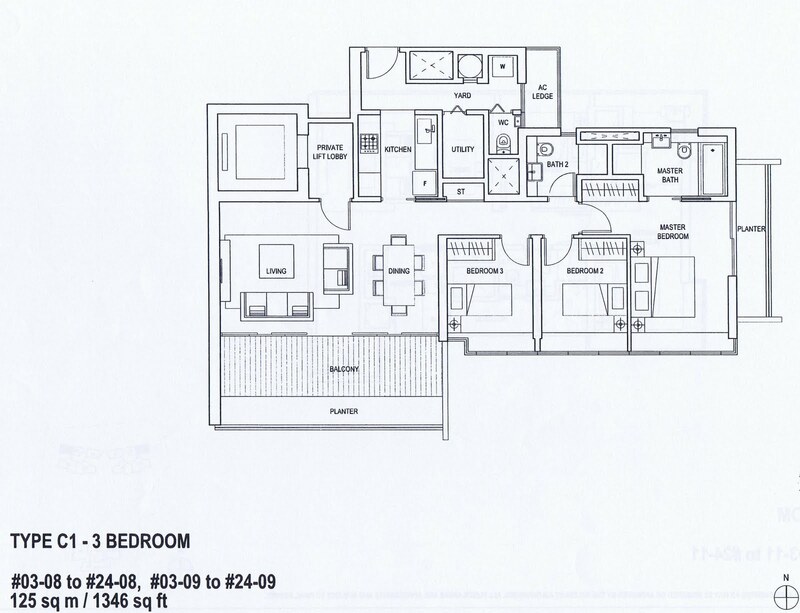 The wife and I actually prefer the layout for the 3+Study over the 3-Bedder. Only issue we have with the former is that it is directly West-facing. So the living and master bedroom in this one and only stack of 3+Study can get quite warm in the afternoon. Skyline Residences started previewing about 2 weeks ago and as of last weekend, about 90 of the 283 units have been sold. 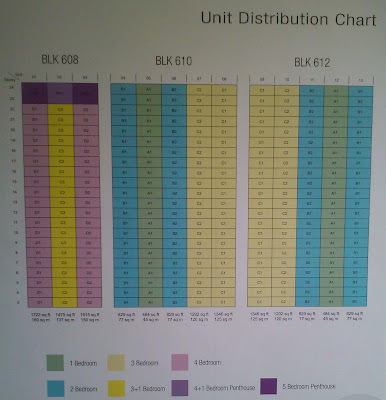 Also, the design of the 3 blocks is such that most of the units will have at least some unblocked view. • For those seeking larger units (3+Study or 4-bedder), you be pleased to know that Block 608 (only block where such units are found) offers you the best view – the balcony of these units will likely get some sea/golf course view while the bedrooms will face the condo facilities. • The main orientation of the project is North-South, which means the units should be quite windy. This may help you save on electrical bill as less air-conditioning may be required. • Telok Blangah MRT station (on Stage 5 of the Circle Line that is expected to be operational in the later part of this year) is just across from Skyline Residences and about 4-mins' walk away. • Residents have the choice of wet market/supermarket/neighbourhood shops and other amenities at the HDB estate located across from Telok Blangah Drive. Alternatively, Vivocity and Harbourfront is just a 5-mins' drive away. 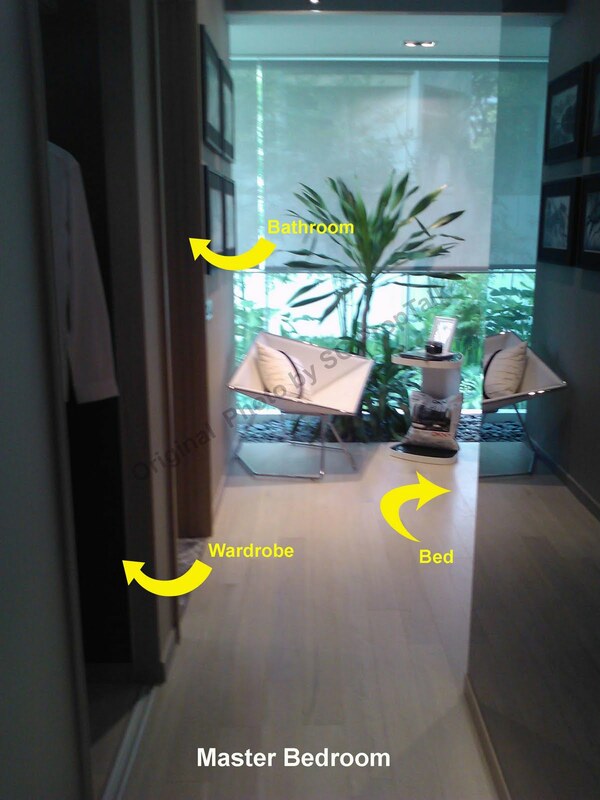 Skyline Residences is also about 10 – 15 mins’ drive to CDB and Orchard Road. So one can hardly argue against the convenience of its location. • The space within the units can be better optimized. 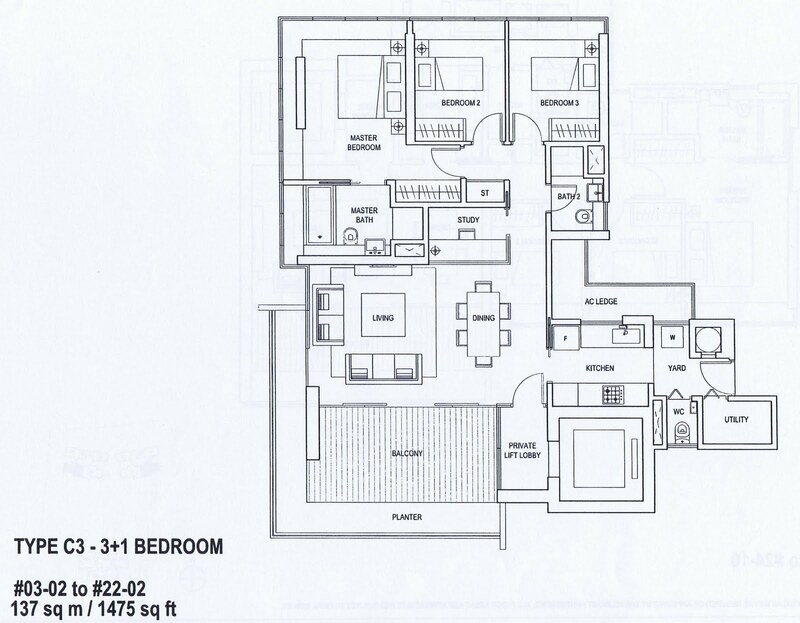 In the case of the 1346sqft 3-bedder, the yard space (long and narrow) is hardly functional. We can also make do with smaller balcony and fewer planter boxes. • While the wife and I liked some of the interior furnishing, we were not exactly “wowed” over by what we saw. This is especially when the units come with asking prices in excess of $1800psf. • The common bedrooms of the 3- and even 4-bedders are too small for our liking. • Although units in Block 608 are likely to get the best view, they are also “nosier” given that the block is nearest to the main road. When we were at the viewing gallery on the 11th floor of an existing block, the traffic noise was quite deafening even with the glass enclosure. • We can only identify one primary school that is within 1-km from Skyline Residences – Blangah Rise Primary. Consolation is that this is a co-ed school. Our Verdict: Skyline Residences is probably a decent buy on account of its location, freehold status and great view. However, we are not exactly sold on the quality as seen in the showflat. This is especially in relation to its asking price. 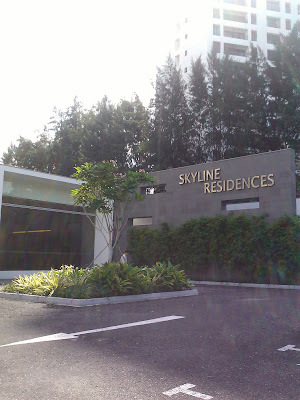 If we compare Skyline Residences with Foresta @Mount Faber just further down the road, we will definitely prefer the former, although some may argue that they are not exactly “apple to apple” (high-rise condo versus low-rise boutique). 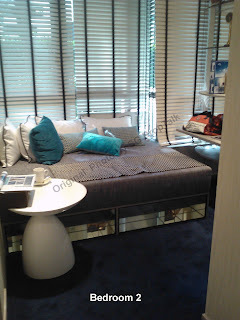 But being the realists that the wife and I are, we will probably go with the cheaper alternative – Harbour View Towers. 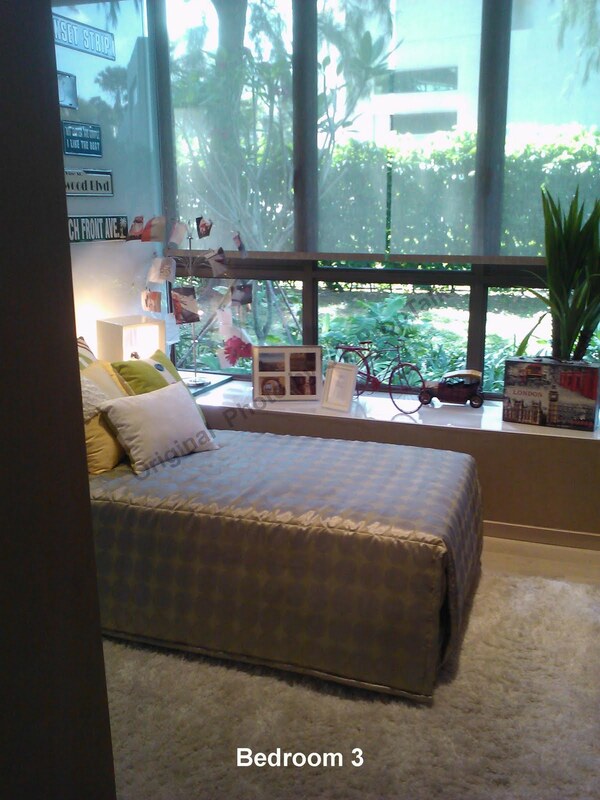 This is a 99-year leasehold condo located right next to Skyline Residences. It is already 17-years old and with far fewer facilities. 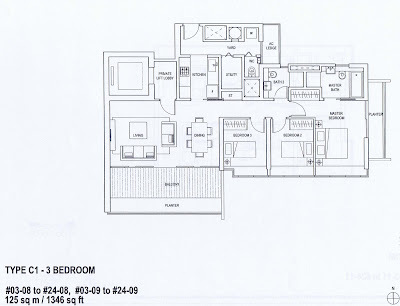 However, the 3- and 4-bedders in Harbour View Towers are equivalent in sizes (some even bigger) than those of Skyline Residences and they do not have balcony/planter boxes. You also enjoy the same kind of view (and traffic noise) and distances from MRT station/amenities, but at a much lower $1,000 - $1,300psf! No Comment to " Skyline Residences (Review) "